1 April 2019: Publication of History Ireland supplement on ‘The Irish revolution, 1919-21: A global history’. On Monday 1 April 2019 the third in a series of special supplements to History Ireland’s special commemorative series on the Irish revolution will be published. The Irish revolution, 1919-21: A global history, is edited by Tommy Graham, Brian Hanley and Fearghal McGarry. Featuring contributions from a host of scholars in the field, will focus on placing the Irish revolution in global context, with two key themes: the impact of transnational factors on the revolution in Ireland; and the impact of the Irish revolution beyond Ireland. Widening the focus from the history of the Irish overseas to the global significance of the ‘Irish question’ enables us to chart how extensively the conflict in Ireland was debated across the world in anti-imperial, labour, suffragist, dominion and other circles. Such an approach offers a way of broadening out consideration of the global dimensions of the Irish revolution beyond the involvement of the diaspora in activities such as fund-raising. Nevertheless there is no doubt but that the effort to raise funds from the global Irish diaspora was crucial in financing the Irish revolution. What also emerges clearly is how transnational communications, primarily newspapers and the telegraph, fundamentally shaped how the Irish revolution was reported and written about. The digitisation of newspapers now allows for this story to be told from many different places. 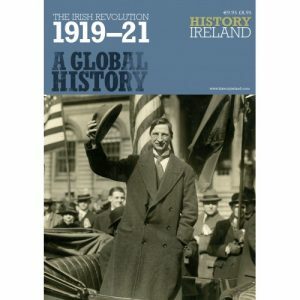 Learn more about The Irish revolution, 1919-21: A global history.